Amin Rajan is the CEO of CREATE–Research, a UK based think tank that specialises in the future trends in global fund management. It works with prominent partners to publish much acclaimed annual reports on prospective challenges and potential responses in the industry. The reports always attract a long series of feature articles in Financial Times, Global Investor, Financial News and IPE. He also writes for these papers regularly. Amin also offers strategic advisory and coaching services to CEOs and CIOs in fund management as they grapple with unfolding industry dynamics. He has developed special expertise in the emerging business models and their successful implementation. Since 2001, he has undertaken specialist advisory assignments for clients as diverse as Aviva Investors, Allianz Global Investors, Axa Investment Managers, BlackRock, Citigroup Asset Management, Credit Suisse Asset Management, Deutsche Asset Management, Invesco, JPMorgan Asset Management, M&G, Martin Currie Investment Management, Morgan Stanley Asset Management, Principal Global Investors, T. Rowe Price, and UBS Asset Management. Amin has presented the results of his work at over 100 major events in North America, , Europe and Asia Pacific in the last five years. His expertise covers, amongst others, leadership, strategy and new business models in financial services. 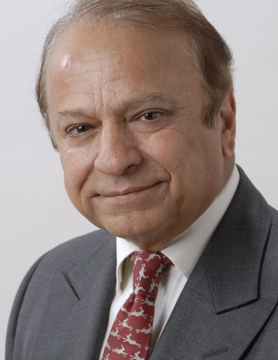 Amin has published numerous books and articles on leadership, business cultures, socio-economic forecasting, globalisation and new technologies. He is a visiting professor at the Centre for Leadership Studies at Exeter University and a Fellow at Oxford University’s Said Business School. He is on the WHU Programme Advisory Board at Otto Beisheim School of Management in Germany. He is also fellow at the Windsor Leadership Trust, specialising in ethical dilemmas.